ADDIS ABABA- FDRE President Dr. Mulatu Teshome and Prime Minister Dr. Abiy Ahmed expressed their deep sorrow over the untimely passing away of Grand Ethiopian Renaissance Dam Project Manager Eng. Semegnew Bekele. In a press release sent to the Ethiopian Broadcasting Corporation yesterday, President Dr. Mulatu said: "Ethiopia has lost its iconic person and Ethiopian people are heartbroken." Filled with strong patriotism, Eng. Semegnew Bekele uplifted the Grand Ethiopian Renaissance Dam, which is the outcome of Ethiopia's long standing ambition to fairly and equitably utilize the river Nile, it said. He was tirelessly working to realize the construction of the project and his legacy will last forever as he was a role model for his compatriots in leading development endeavors. "Ethiopia has millions of people who can finish the grand project to which he toiled so much." "The grief is intense that he was not able to witness the completion of the Dam which he cared about much and treated it as his child." His name will be remembered and his dream would come true by completing the dam, he stressed. Also, Prime Minister Dr. Abiy Ahmed is saddened and utterly shocked to hear the death of Eng. Simegnew Bekele. PM Abiy received this heart wrenching news with great sorrow as he arrives in the US. Police is conducting investigation. 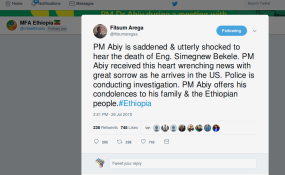 PM Abiy offers his condolences to his family and the Ethiopian people, twitted Fitsum Arega the Prime Minister's Special Office Head. Meanwhile, Ethiopian People's Revolutionary Democratic Front (EPRDF) also expressed its heartfelt condolences over the death of the project manager. The Front said Eng. Semegnew efficiently discharged the responsibilities entrusted by his country and the people of Ethiopia. "The current stage of the Dam's construction is much ascribable to his tireless job." His dedication and determination will remain among the hearts of all Ethiopians, it added. The people and government of Ethiopia are determined more than ever to accomplish the project, the statement said. Also, State Governments, various ministries, and other public organizations have expressed their deep sorrow over the death of Eng. Semegnew. In their messages, all have vowed increased commitment to do everything at their disposal to see the completion of the Dam.